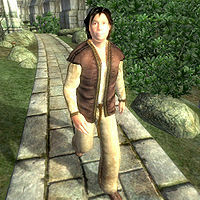 Hastrel Ottus is a Breton commoner living in the Temple District of the Imperial City. Along with his wife, Alessia, and daughter, Ida, he is a devout temple worshipper. He occasionally makes trips to Leyawiin, and he loves to talk about Akatosh, though his daughter prefers Mara. Hastrel wears common middle-class clothing. His attire includes a brown shirt, some light brown linens and a pair of thick cowhide shoes. He carries his house key and a decent amount of gold. He will introduce himself with, "My name is Hastrel Ottus, and I'd like to talk about Akatosh." If you ask him about the Imperial City, he will say: "Akatosh speaks to us all, but we never listen. Go to the Temple of the One. Read the Covenants. Praise the Nine!" Hastrel Ottus lives a standard citizen life. He starts his day every morning at 6am where he enjoys a two hour breakfast in his house before starting his daily activities. At 8am he leaves his house and wanders around the temple district for six hours occasionally interacting with other citizens. At 2pm he heads to The All-Saints Inn for a two hour lunch. After enjoying his lunch, he then leaves the inn and wanders around the Temple District for a further two hours. At 6pm he returns to The All-Saints Inn where he socializes with his fellow citizens. At 8pm he heads home where he spends the rest of his evening wandering around the ground floor of his house. He skips supper and strolls upstairs into his quarters and goes to bed at 12am. The exceptions to this schedule are on Loredas and Sundas, where after breakfast he spends the entire day wandering around the Temple District before returning home at the usual 8pm. On the 15th of every month he makes a two day trip to Leyawiin, during which he may be attacked and killed like most traveling NPCs. He departs from his house at 9am and then exits the city. After crossing the Talos Bridge, he heads south on the Red Ring Road and follows it until he reaches Pell's Gate, then heads south on the Green Road. He will keep walking on this road all the way to Leyawiin, on the way passing the city of Bravil. This long trip takes him twenty-four hours and he usually reaches his destination just before 10am on the following day. Upon arrival, Hastrel will head over to The Three Sisters' Inn and book himself a room. He will spend one day in Leyawiin, mainly socializing, before he departs for the Imperial City on the 17th at 9am. He will take the same route back and if he is untroubled on the road home, he will arrive back at his Imperial City home at 10am the next day. During the Light the Dragonfires quest, Hastrel like most other Imperial City citizens is confined to his house. Despite being married, Hastrel and Alessia sleep in separate beds. This page was last modified on 20 August 2017, at 00:07.